Finally, all questions concerning the rise of Christianity are one: How was it done? How did a tiny and obscure messianic movement from the edge of the Roman Empire dislodge classical paganism and become the dominant faith of Western civilization? Although this is the only question, it requires many answers--no one thing led to the triumph of Christianity. This book details how that obscure, marginal Jesus movement became the dominant religious force in the Western world in just a few centuries. Some of the subjects convered are the role of women, the martyrs, class basis and Christianizing the urban empire. The author gives explanations to why and how it succeeded as well as unexpected blockades along the way. The Rise Of Christianity by Rodney Stark was published by HarperCollins in March 1997 and is our 31026th best seller. The ISBN for The Rise Of Christianity is 9780060677015. 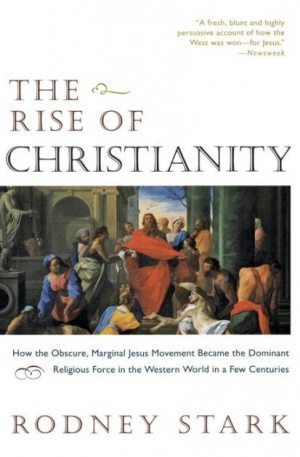 Be the first to review The Rise Of Christianity! Got a question? No problem! Just click here to ask us about The Rise Of Christianity.